Stop home invasion robbers in their tracks! Learn about home defense weapons so you can protect your family from attack. The fact is, alarms and security companies are not the complete answer to your safety when you are inside your household. They only help alert you to a possible intruder, but they do nothing to stop him from coming in and hurting you or your family. Note: The law of your country may be different from mine. Click here to read my "mini-disclaimer" about weapon laws, then come straight back here! As I mention on my "Police Response Time" page, most times the police or security company will take too long to arrive at your home in the case of an attack. They'll probably arrive AFTER the bad man or men have attacked you and your loved ones and made their getaway. This is an uncomfortable thought, especially if you have always taken comfort in the idea that you can simply "Call the police!" if you ever find yourself in trouble. I don't know about you, but I would MUCH rather feel a little uncomfortable now, if it helps me to prepare myself for the way criminals REALLY operate. By facing up to the reality of how criminals actually attack people in their homes, you (and I) will have a much better chance of preventing a tragedy. You may be wondering why I would recommend having home defense weapons in case of a home invasion (Home Invasions are when criminals come into your home WHILE you are there and attack you and your family). This question is best answered by first understanding how home invaders usually commit their crimes. I go into more detail on my "Home Invasions" page, but criminals who choose to target a home that they KNOW is occupied are a very different breed from the normal "Burglar". Burglars try their BEST to only break into houses when they KNOW the owners are away. This makes it easier for them to simply steal what they want and leave. Home invaders come into your home knowing you and probably your family is inside the house. They do this on purpose! Since they know that home owners tend to react with shock and possibly ANGER when they find themselves face to face with a criminal in their own homes, the criminals come prepared to use VIOLENCE. ...you have the WRONG idea! So now that we know what to expect, I hope you are starting to appreciate the need to have something a little more dangerous than your fists to protect yourself with at night! By having home defense weapons within reach of your bed at night, you are immediately increasing your chances of surviving a violent criminal assault on your home. If you have a family, you are responsible for protecting them. It's important for me to be clear here: this page is not only directed at men! Anyone can be at risk of a home invasion. The best way to improve your chances of survival is to have a home defense weapon and to get some training in order use it most effectively. Which Home Defense Weapons Are Worth Having? ...you are about to be in a fight for your life and the lives of those you care about! Since that is the reality, any action you take to defend yourself will have to be DEADLY FORCE. There will be no room for kindness or compassion in this situation. Quite simply, if you don't kill them, they will kill you. It may be a shocking idea for some, but that’s the mindset you HAVE to have if you want to have any hope of coming out of this experience alive. Note: The above list is in order of (my) preference, from most desirable to least desirable. 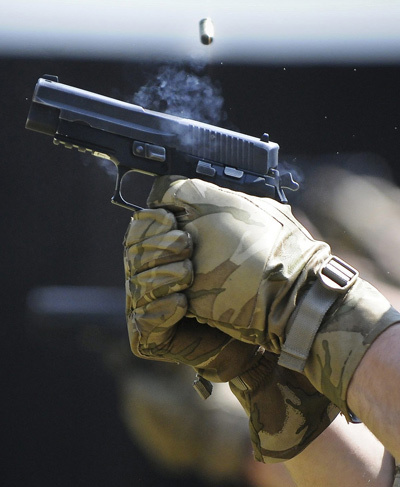 Handguns are small and light enough to manoeuvre around easily in the tight confines of a home. Walking through doorways and corridors in the middle of the night when you are in fear of attack will be much easier with a small weapon such as a handgun. The other advantage of a handgun as a home defense weapon is that it can be held close to your body and fired from there if you are surprised by an attacker. It will be much harder for him (or them) to grab your handgun and take it away from you than it would be to wrench a longer weapon such as a rifle or shotgun out of your grip. If you are able to subdue your attacker/s and want to call the police on your cell phone, it will be quite straightforward to hold them at gunpoint with the handgun in your one hand and your phone in your other hand. That same action would be quite a lot harder to do with a larger, heavier weapon (rifle or shotgun). 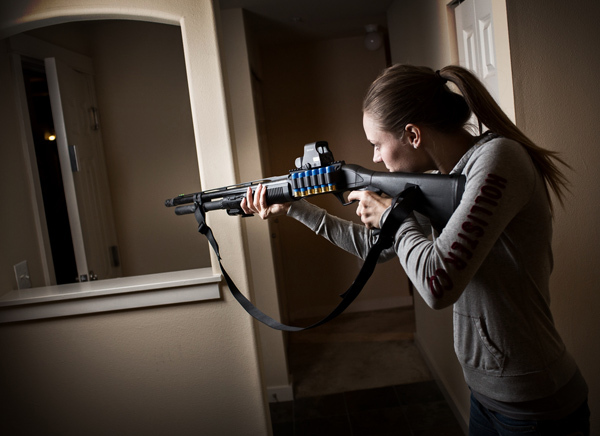 Having said all of that, if you have a shotgun or rifle as your home defense weapon, you still have a powerful and capable weapon in your hands. There are just a few things to be aware of. Since these are physically larger and longer weapons, the way you handle them inside the confines of you home will have to be quite different from the way you would handle a handgun. When you go through doorways you will have to be wary of the possibility that a criminal might grab the long barrel and try to wrench the gun out of your grasp or push it away from himself. If this happens, you are now in the highly dangerous situation of wrestling with a violent criminal for the control of a deadly weapon. Not a situation you want to get yourself into if you can help it! Holding someone at gunpoint for any length of time will also be harder to do with the much heavier long gun. Another thing to be HIGHLY aware of is that a rifle is MUCH more powerful than a handgun. The bullets from a rifle can easily punch straight through a brick wall and keep going. There have been cases of innocent people getting hit with rifle bullets that first passed through the wall (or even several walls) of a nearby home. Shotguns don't suffer from the same problem though, since the pellets quickly lose their speed. They won't go through brick walls and only pose a danger to those inside the house (hopefully the bad guys). This is one of the reasons why I would recommend a shotgun over a rifle for home defense. The other reason for my preference of shotguns is for the massive wound that shotguns usually inflict on the person being shot. The more massive the wound the attacker receives from your gun, the more likely he is to stop attacking you sooner. While nothing is guaranteed, a shotgun blast usually does a pretty good job of stopping a violent attacker in his tracks! If you have any choice at all in the matter, a gun (rifle, shotgun or handgun) is MUCH better to have as a home defense weapon than a knife or an impact weapon. ...I certainly wouldn't complain if I had a knife instead of my bare hands when the bad guys come crashing through the door! The main disadvantage with knives and impact weapons in this kind of scenario is that they are "Close Quarters Weapons". In other words, they can only damage your attacker if he is within arm’s reach of you. While people may throw knives in the movies, I wouldn't recommend throwing away your weapon in a real life or death fight! It probably won't turn out very well for you! If you have a gun, you can stay in your bedroom, hiding behind your bed with it pointed at the door, ready to shoot anyone who comes through it. You have the luxury of DISTANCE. With a knife or baseball bat though, you are going to have to aggressively move closer to your attackers and stab or bash them in order to stop their attack. This is a much more dangerous situation for you, since they almost definitely have weapons of their own. If they have a gun, you may not be able to get close enough to them before they shoot you. If they have knives, when you are close enough to cut them, they are also close enough to cut you! I don't want you to go away feeling like you are doomed to failure and death if you don't have a firearm to protect yourself and your family. That's not the case at all. I simply want you to understand the relative advantages of the various home defense weapons you can get. If you are planning to use a knife or impact weapon like a heavy metal torch or bat as a home defense weapon, you must be prepared to aggressively attack the home invaders as soon as you realize what's happening. If you do this, you will have the advantage of surprise, since they probably won't expect such a ferocious and effective attack from you. Remember not to stop attacking with your weapon until they are all down on the ground and you are sure they are no longer a threat. This is not a time for mercy or "feeling sorry" for these criminals. If you make the mistake of "going easy" on them or hesitating at the last second, you may very well lose your life and those of your loved ones. I hope you never have to face a home invasion situation, but if you ever do, I hope that you will gather up all the aggression and rage that you have inside you and make your attackers wish they had picked a different house! Mini-legal disclaimer notice: Before you read and follow the advice in this article, I need to mention the law. Even though I am writing these words from South Africa, this website is read by people from a number of different countries around the world. Every country has its own laws about carrying and even owning weapons for the purpose of self defense. It's up to each of you to find out what your country allows and then follow those rules. The advice and opinions on this site are not to be regarded as legal advice. 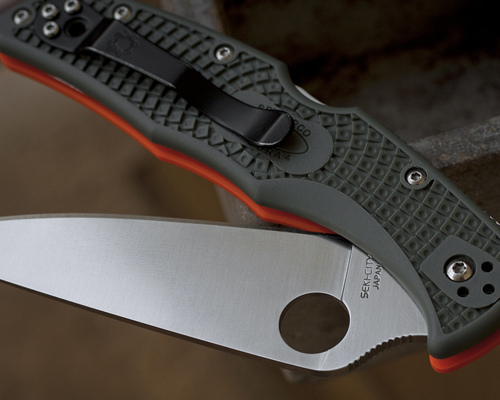 Best Knives For Self Defense - How do you choose? It's simple. Non Lethal Weapons - These have an important role in your overall self defense setup.